Can anyone report on the food at Aroy Thai at 4656 N. Damen (near the Damen stop of the Brown Line)? How does it compare to Spoon Thai? Last edited by funghi on June 27th, 2006, 7:38 am, edited 1 time in total. 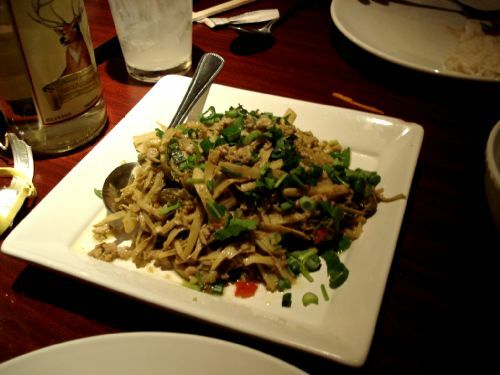 funghi wrote: Can anyone report on the food at Arroy Thai at 4656 N. Damen (near the Damen stop of the Brown Line)? "Aroy" is spelled with one "r," not two. And, a run through the search engine will turn up quite a bit of commentary. I, for one, have posted a number of times on Aroy Thai. 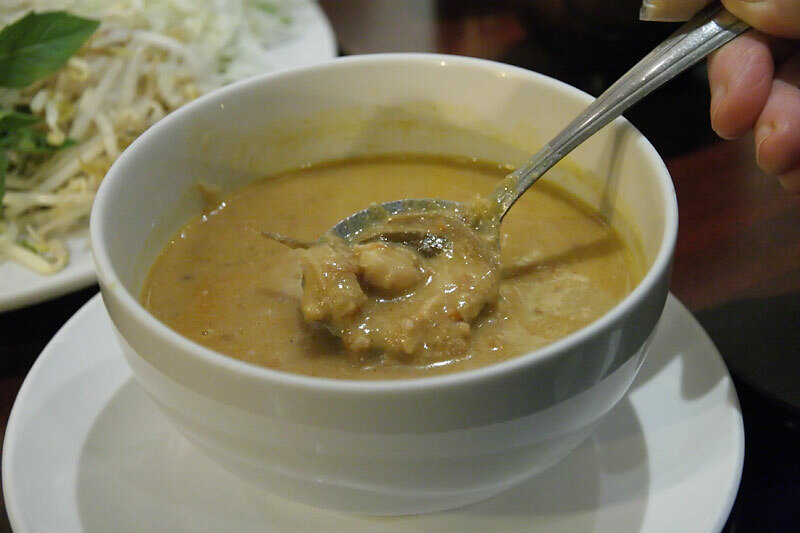 funghi wrote: How does it compare to Spoon Thai? 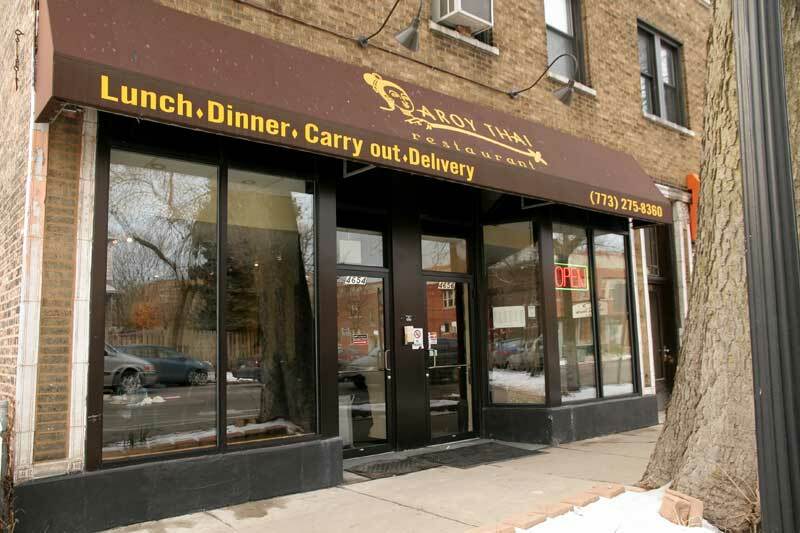 Aroy Thai is one of the best Thai restaurants in the Chicagoland area, and like any other establishment of this calibre, it has a number of unique offerings. 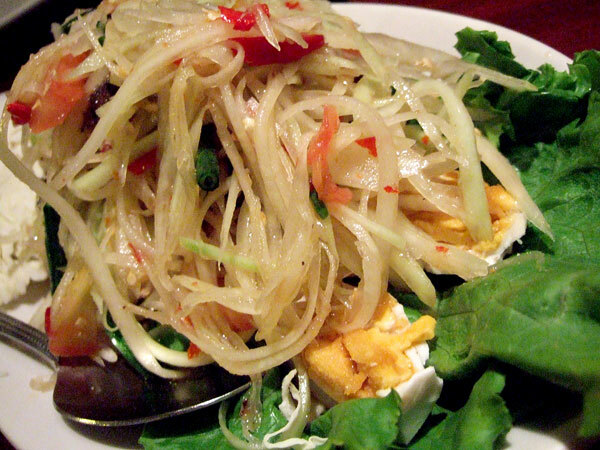 Oh, and see if you can get them to make sômtam puu sài khài khẽm (papaya salad with pickled crab and salted duck eggs). That is a favourite of mine. Erik M. wrote: Apples and oranges, my friend. Interesting comment...do you care to elaborate? We went to Siam Country, which is right at the Damen stop of the Brown Line, on Friday night, and really liked it. I had the Thai Cashew Nut with duck (boneless duck stir-fried with cashews, onion, mushrooms, broccoli, bell pepper, carrots, and pineapple) and it was really good. So were the fish cakes. Judging by where you were, I assume you mean Sweet Occasions, which carries Chocolate Shoppe ice cream from Madison, as did Evanston Creamery and does... The Chocolate Shoppe on Devon. Mike G wrote: Judging by where you were, I assume you mean Sweet Occasions, which carries Chocolate Shoppe ice cream from Madison, as did Evanston Creamery and does... The Chocolate Shoppe on Devon. My point above is that comparing the top-tier Thai establishments is largely folly. There are a number of (exceptional) unique offerings at Aroy Thai which you will not find at Spoon et al. In turn, there are a number of (exceptional) unique offerings at Spoon et al. which you will not find at Aroy Thai. 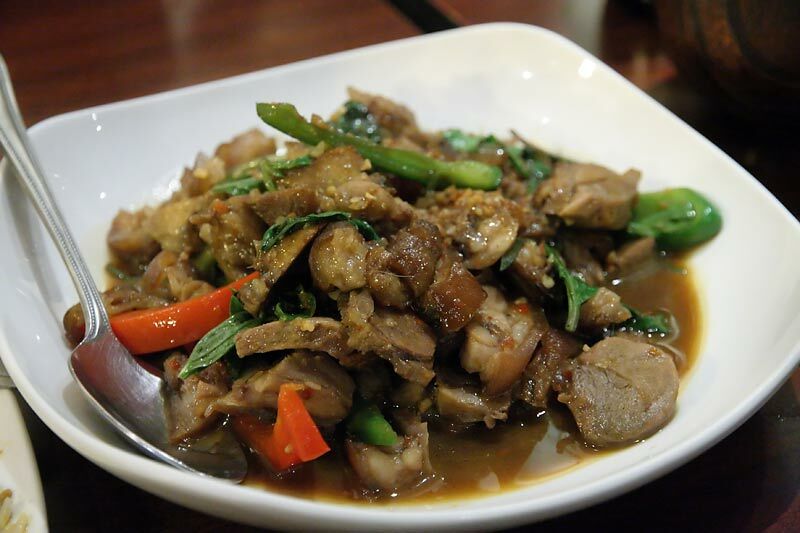 * For example, even though there are marked differences in their preparation, I equally enjoy the phàt krà-phrao kài at Spoon and Aroy Thai. Thanks, I wasn't sure if you meant different dishes that each did well or very different preparations of the same dish or something else entirely. I have a vague recollection of, maybe 2 years ago, a discussion about genre differences between the sorts of Thai food served at, I think it was, Spoon Thai, Siam Noodles & Rice, and TAC Quick. It's clear that there are differences in execution between the top Thai restaurants, but I don't have a sophisticated enough understanding of Thai cuisine to understand the degree to which these differences express the palate of the chef, an attempt at a certain "style" of cooking or restaurant, or something else. * This item is clearly indicated on my 2005 Aroy Thai menu translation. And, while the version pictured does not include softened beef tendon (ehn), it is available by special request. 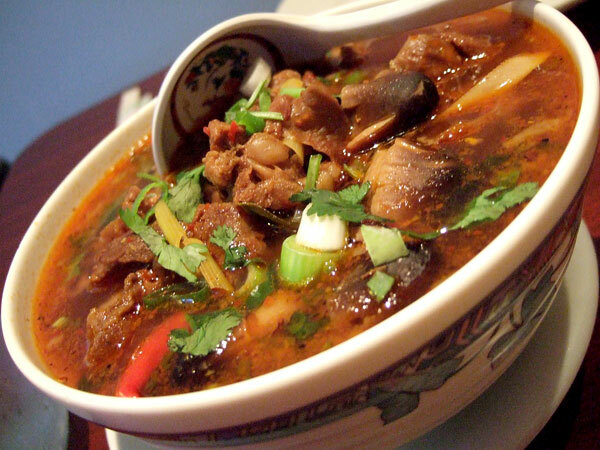 ** This item is only available at Aroy Thai by special request. A bit embarrassed to discover (spurred to investigate by reading the TAC Quick thread) that the woeful lack of Aroy Thai coverage here is partly my fault. For several years, I have been the custodian of some Aroy Thai pics from a March 2007 meal I shared with Stagger, Dmnkly, and others. Stagger's pics are actually from that meal; Dmnkly's may be from that meal, or may be from an earlier meal with many of the same dishes. I don't have dish names for all, and granted, this is very dated information, yet hopefully it will spur some contemporary reporting. As I mentioned in the TAC thread, Aroy is still operating at a very high level and is constantly updating their translated menu. I had a meal there last week that was in every way as good as anything I have had at Spoon, Sticky Rice or TAC. I should mention that the sausage I spoke of in that thread has not yet made it into the translated menu. I learned about it only due to the fact that I had ErikM., visiting from LA at our dinner. Of course, the staff was very gracious and interested in our feed back as not many non-Thai folks have had the dish. The point is that they knew we were coming and don't be upset with them if they don't instantly know what you are requesting. Just be patient and friendly. My understanding is that it is on the Thai language menu and the staff will be very happy to serve it if you can communicate what you want. 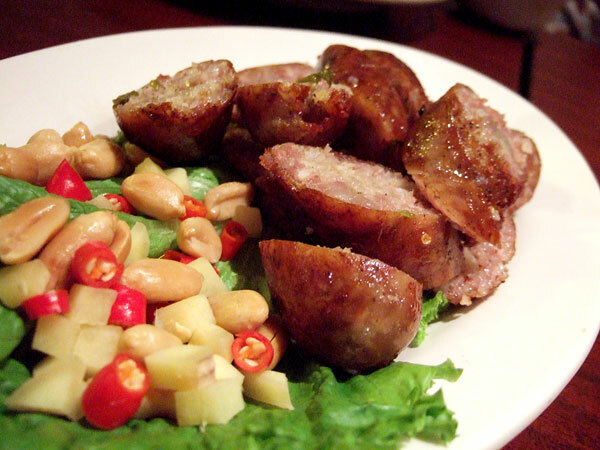 The way the sausage translates is actually: mild pork-based sausage with rice and chopped bean thread noodles. (from Erik). I haven't posted pictures from the meal as I left my memory card at home, but I had a "best ever" version of crispy pork belly with ginger stir fry (dry-no coconut milk), screaming fresh and pungent Som tam with crab and a salad similar to the "pork salad above but with raw shrimp (this may not be translated yet either but I think it would be pretty easy to communicate what you want as long as they have the shrimp to make it in house at the time). I do know that there are a few other dishes we had that they are still tinkering with such as a version of crying tiger that uses NY strip (a very, very expensive cut for this dish). 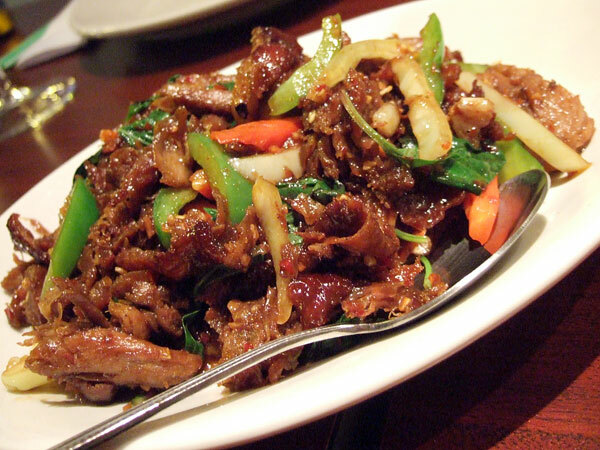 Aroy Thai is clearly one of the pillars of authentic Thai food in Chicago. One of the only issues I had was how to explain what they specialized in (as Sticky Rice - Northern, Spoon - sour and salty flavors, TAC grilled meats and rich soups). Erik explained that they do their best stuff with dry curry pastes and they use a different brand of fish sauce from most other places in the area. Of course, this is not the limit of the kitchen's talent, just as it is not the limit in the restaurants above. In any case Aroy Thai deserves LTH attention every bit as much as the other Thai restaurants that are willing to take a chance and open their kitchens to all that want to eat as Thai customers do. 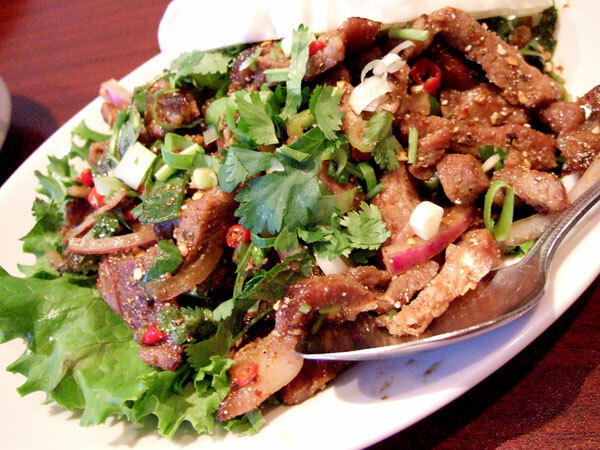 Stagger wrote: Aroy Thai is clearly one of the pillars of authentic Thai food in Chicago. One of the only issues I had was how to explain what they specialized in (as Sticky Rice - Northern, Spoon - sour and salty flavors, TAC grilled meats and rich soups). Erik explained that they do their best stuff with dry curry pastes and they use a different brand of fish sauce from most other places in the area. Of course, this is not the limit of the kitchen's talent, just as it is not the limit in the restaurants above. In any case Aroy Thai deserves LTH attention every bit as much as the other Thai restaurants that are willing to take a chance and open their kitchens to all that want to eat as Thai customers do. I couldn't agree more, and though I have only myself to blame (after all, you don't see any posts from me upthread), I often find myself surprised that Aroy doesn't get more attention around these parts. If it's still where it was a couple of years back, that needs to change. Dmnkly wrote: If it's still where it was a couple of years back, that needs to change. wow, thanks for reviving this thread! I live in the neighborhood, and it is my good fortune to have access to at least a dozen excellent thai options -- however, the downside is that I have overlooked this one. I will check it out as soon as i can! 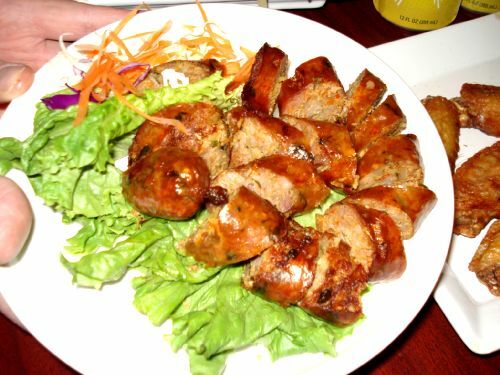 > Grilled Pork Neck - - Tender, moist, pork and a really generous portion, with a great fish-saucy sauce. Medium rare in some areas, medium well in others. Good stuff. REB had to point at her neck to successfully order this one. 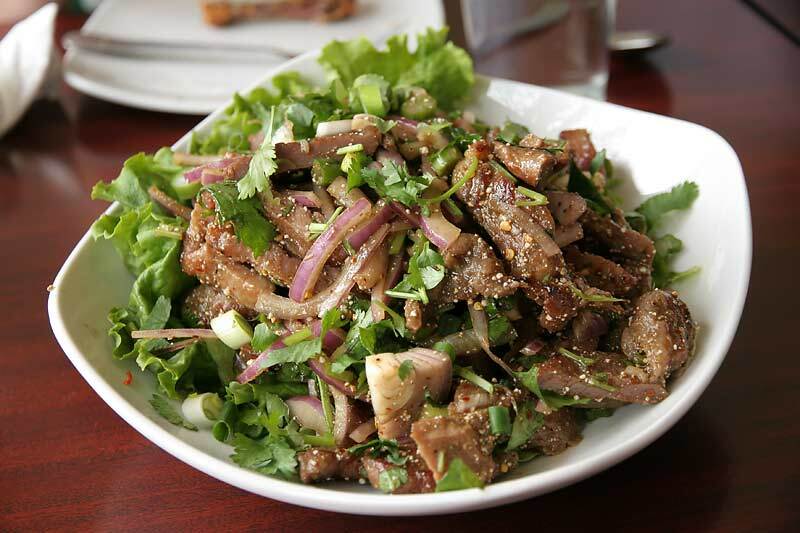 > Pork Larb - - Ordered by using Erik's translation above of lâap khûa: Northern Thai-style spicy salad with minced pork, garlic, and aromatics (thanks, Erik!). This was a wonderful dish, filled with ground pork and bits of pork liver and a few other miscellaneous and unidentifiable pieces and parts. When we were served this, we knew the food hadn't been "dumbed down" for us. This was the driest larb I've ever had (there was absolutely no puddle of fish sauce at the bottom of the plate) and also the first one with meat other than of the ground type. > Pickled Bamboo Shoots and Pork - - Again, ordered using Erik's translation of phàt nàw mái náam phrík nùm: pickled bamboo shoots stir-fried with minced pork and green chile sauce. Wow. Really enjoyed the uniquely flavored and seriously funky tang of this stuff. There may be a fermented quality to the bamboo shoots, which reminded us both a bit of similar pickled/fermented Burmese dishes. 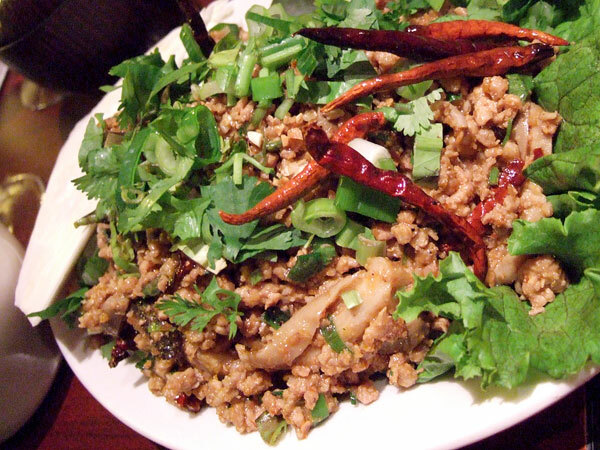 > Thai Fried Rice with Pork - - Ordered off the standard menu. It was fine, had a nice little funk likely attributable to shrimp paste, but I'd probably save the stomach space for something else next time. The pork was dry and paled in comparison to the pork neck above. In D.C., where REB and I last lived, Thai food is uniformly sticky-sweet and extremely Americanized. 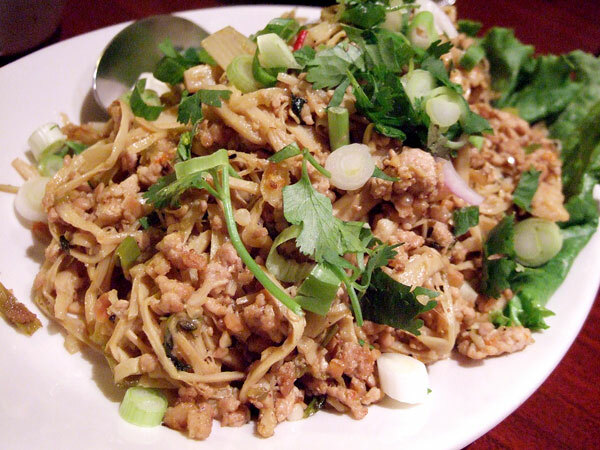 It is really wonderful to have so many options for authentic Thai food here in Chicago. REB and I both think our dinner tonight was as good as our one meal at Spoon, but not quite up to the level of our many meals at TAC Quick. The flavors at TAC Quick seem to shine more brightly, with a wonderful balance of sour, spicy, salty, and sweet - - it's just right. That said, the prices are a bit more reasonable at Aroy, with everything we ordered in the $7 range. Moreover, I don't think that Aroy gets the crowds that TAC Quick does, and parking is certainly easier (no problem finding a free street spot around the corner). And, as mentioned above, Aroy has some dishes that aren't available elsewhere. We'll definitely be back before too long. Thanks for reviving the thread. As if that could somehow be a BAD thing (which I know is not your intent)! I'm just reminded of a Monty Python skit about another 4 letter meat(like) product . . .
"...or Lobster Thermidor a Crevette with a mornay sauce served in a Provencale manner with shallots and aubergines garnished with truffle pate, brandy and with a fried egg on top and pork . . .
stagger wrote: I should mention that the sausage I spoke of in that thread has not yet made it into the translated menu. I learned about it only due to the fact that I had ErikM., visiting from LA at our dinner. Of course, the staff was very gracious and interested in our feed back as not many non-Thai folks have had the dish. The point is that they knew we were coming and don't be upset with them if they don't instantly know what you are requesting. Just be patient and friendly. My understanding is that it is on the Thai language menu and the staff will be very happy to serve it if you can communicate what you want. I liked this sausage a lot and would urge people to give it a try. 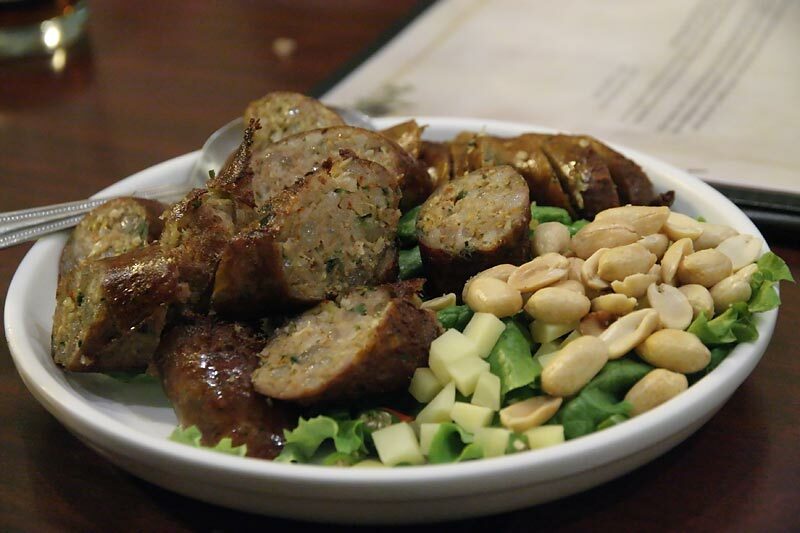 It would be a perfect gateway sausage for those put off by the tangier Issan version but should hold the interest of more experienced sausage eaters. Another standout from the meal, and I believe also new to Aroy's menu, was this sour soup with pork ribs. Haters of meat jello should check their prejudices at the door. I thought it was one of the most pleasing Thai soups I've had in a long time. 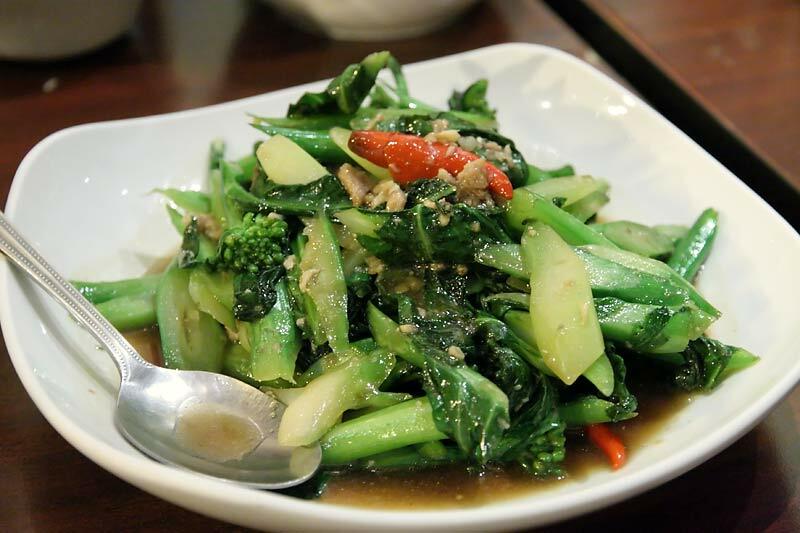 My favorite dish at Aroy is Chinese broccoli stir fried with salted fish. 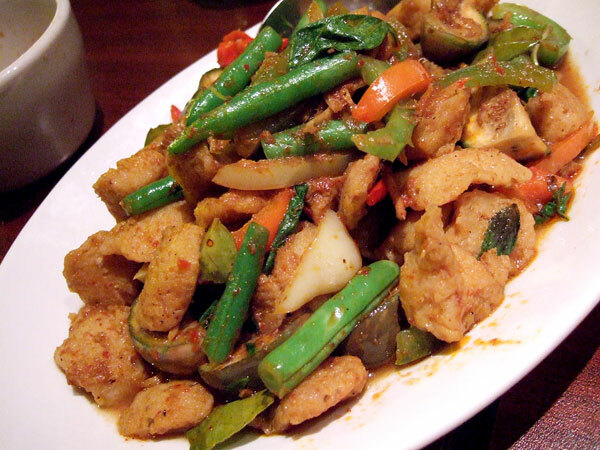 This might be my favorite Asian vegetable dish anywhere in Chicago. I enjoy Aroy Thai every time I visit and am at a loss to explain why I don't go more often. I think it has finally made my short list. Aroy Thai is my go-to Thai restaurant since I live right across the street. Full disclosure- TAC Quick is still my favorite Thai restaurant in the city. 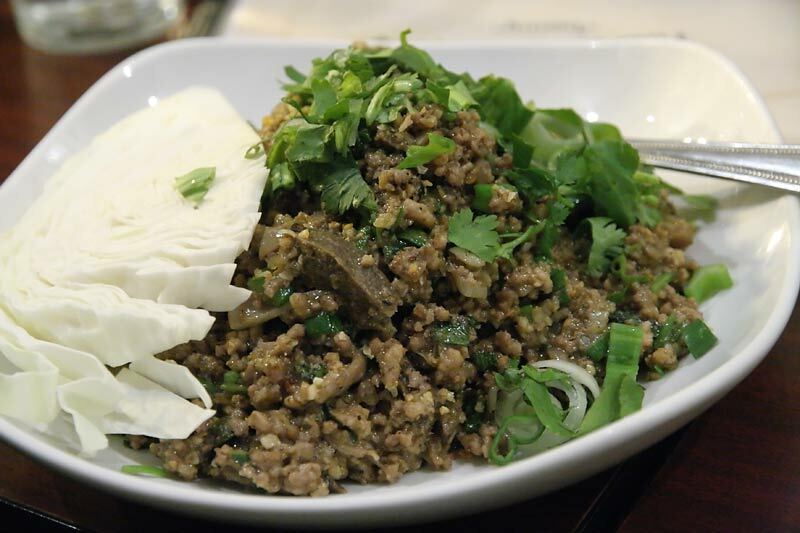 Two other dishes that I think Aroy does really well are the pork omelette (I think it's much better, and richer than Spoon's version) and the basil ground pork with preserved duck eggs (similar to TAC's but they use chicken there instead). There's also a new pork rib appetizer that's on the specials board that is quite hearty and crunchy. I fell in love with Aroy Thai today, where I was able to get something as funky and fantastic as Khanim Jiin Naam Ya with Luuk Chin, while my wife was able to get the best Penang curry either of has tasted in years. Without realizing the answer was just blocks from other favorites, we've spent years wishing we could find a place that served authentic dishes with serious funk and spice, along with well-prepared versions of Ameri-thai classics. We've been consistently disappointed with the milder noodle dishes and curries at TAC, Sticky Rice and Spoon. In addition to the very fishy, scorching-hot khanim jiin naam ya, I had a nice larb kai which was served warm with very fresh flavors and good spice. It didn't have the deeply roasted rice essence I love so much in Sticky Rice's version, but it definitely makes the Top 5 Chicago larbs list, which is high praise. Friendly people, nice decor (fantastic flower-themed artwork), and just steps away from the brown line stop... Aroy figures to become a staple in our dining rotation. 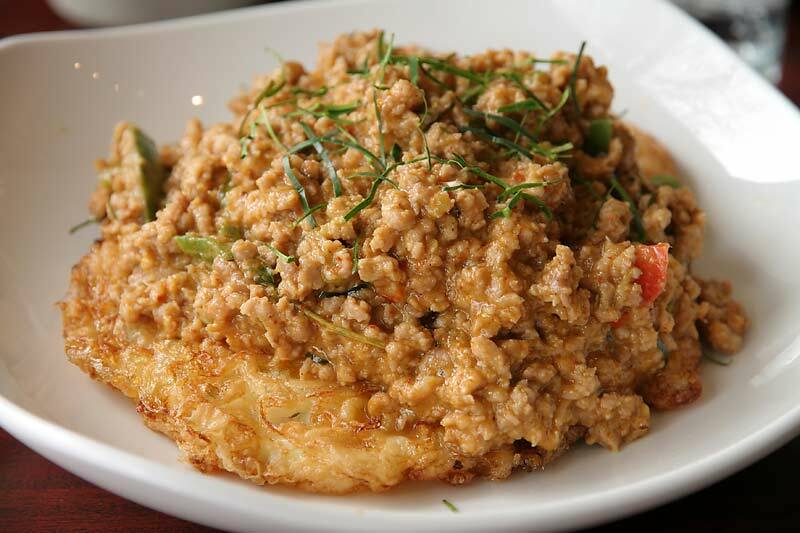 Interestingly, at a dinner a couple of weeks ago, when a visiting Thai cookbook author* asked the waitress if they had khanom jin, she recommended Aroy for it. * Cookbook is Thai, not the author. It had been almost 2 years since my last trip to Aroy, so I remedied that last week by eating there twice in 3 days. On Thursday night I joined some fellow LTHers who were kind enough to invite me to a group dinner they set up. Since there were 10 of us at that meal, we got to try a lot of dishes and many of them were excellent. In fact, they had such an impact, I couldn't stop thinking about several of them and felt compelled to return. So, on Saturday I decided to take the family there for lunch. Needless to say, the food on both occasions, most of it from the Thai Classics Menu, was terrific . . .
A really great rendition with a nice sour to savory ratio. 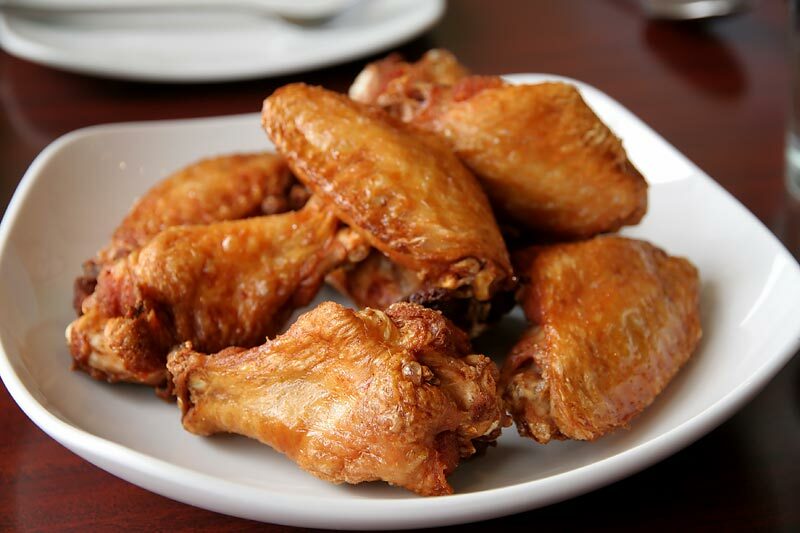 Piping hot, crispy-skinned and perfectly cooked. I don't know if these were seasoned or marinated at all because they seemed a bit on the bland side but again, they were perfectly cooked and the sauce with which they were served (not pictured) was a funky-licious condiment. 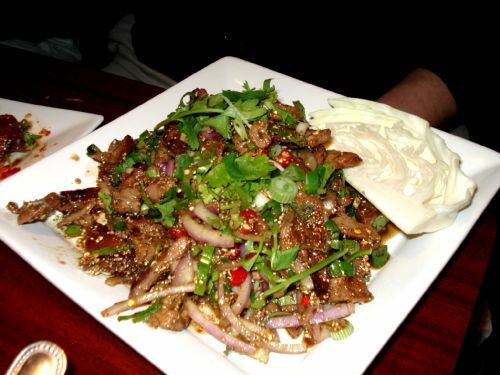 I absolutely loved this dish, which is like larb on steroids. It was tart, spicy, savory and full of great textural contrasts, too. I love Thai soups and this one may be the best I've ever had in Chicago. The broth was insanely flavorful, with a depth and richness that just blew me away. The meatballs and large pieces of ultra-tender beef were both excellent, too. Hell, even the mushrooms, which had absored quite a bit of the broth, were exceptional. Another spectacular dish that really delivered varied and complex flavors and satisfying textures. It was plenty spicy, too even if I bit more so during the group dinner than the following lunch. I purposely didn't order it spicy at the lunch but I kind of wish I had. 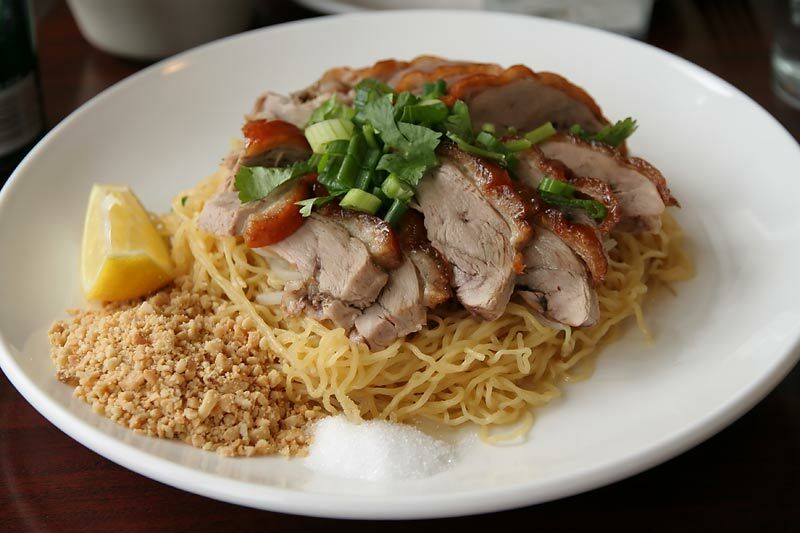 Nicely roasted duck and al dente noodles that were flavorful. My son ordered this at our lunch and I was so full from eating other items I only took a small taste of this. I've only ever had this dish before at Sticky Rice and I thought this version was much more enjoyable. 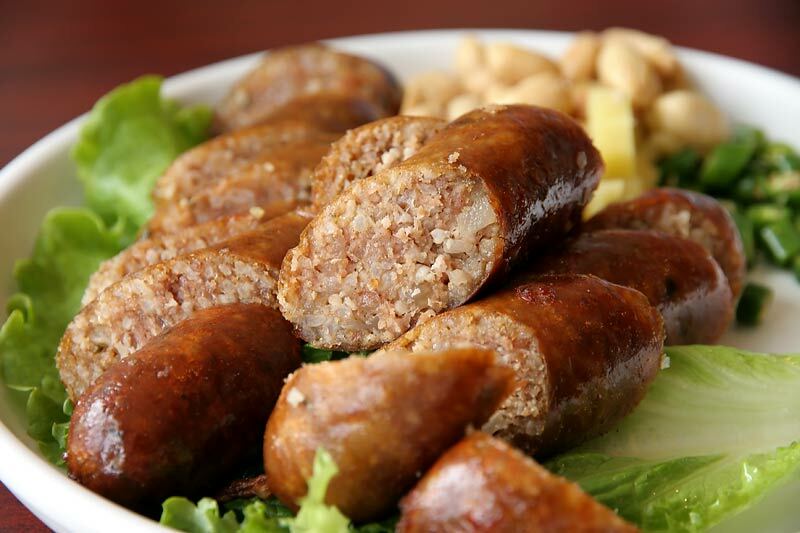 A spicier and less sour sausage than the Isaan. Really great seasonings made this a distinctive, wonderful dish. This dish, while delicious, was seriously challenging in that it had a very intensely funky aroma that was noticeable even from a few feet away. But it reminded me of Durian in that it tasted a lot better than it smelled. So glad I got to try it. 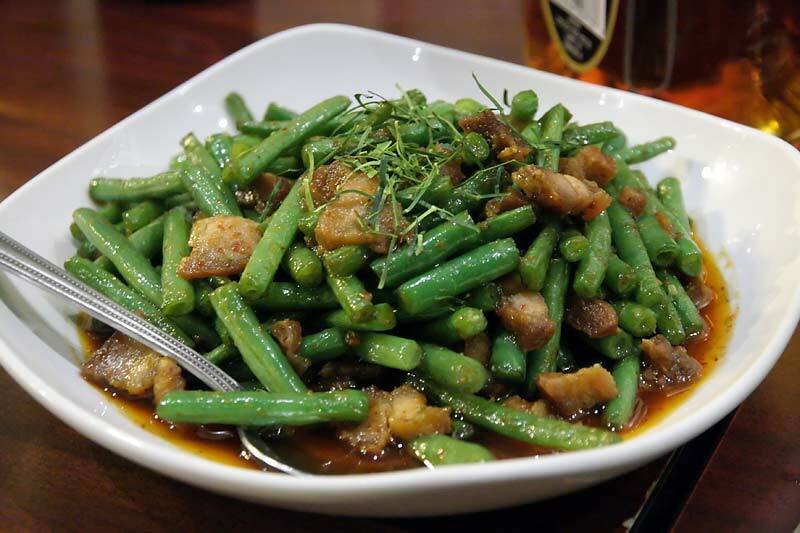 Loved the curry paste and the perfectly tender green beans, and I'm not even sure it needed the pork, which was more chewy than crispy. I liked the bitter Chinese broccoli here but wasn't wild about the fishy sauce. This is the one item of which I didn't completely finish the portion I took. By the time this one came around I was damned full but I really liked the flavor and texture of the pork, which was soft but not mushy at all. This was like a soupy pad see ewe that would have probably been great on its own. However, served after a bevy of more aggressive and assertive dishes, it kind of got lost in the crowd. If I learned one thing this past week it's that Aroy needs a place on my regular rotation. As much as I enjoy TAC Quick, Spoon Thai, Sticky Rice and Elephant Thai, Aroy really is worthy of a regular stop and I plan to make it just that. I'm really sorry that I let it fall off my radar and definitely won't make that error again. Nothing like some Ronnie pix to drive folks to an oft-overlooked gem. Always glad to see Aroy get some love. Beautiful pictures Ronnie. I really thought Thursday's meal at Aroy was outstanding. My favorite dishes were the Tom Yam soup and the ground pork atop fried eggs - two of the best Thai dishes I've enjoyed anywhere, and that Tom Yam ranks among the best soups I've ever tasted. 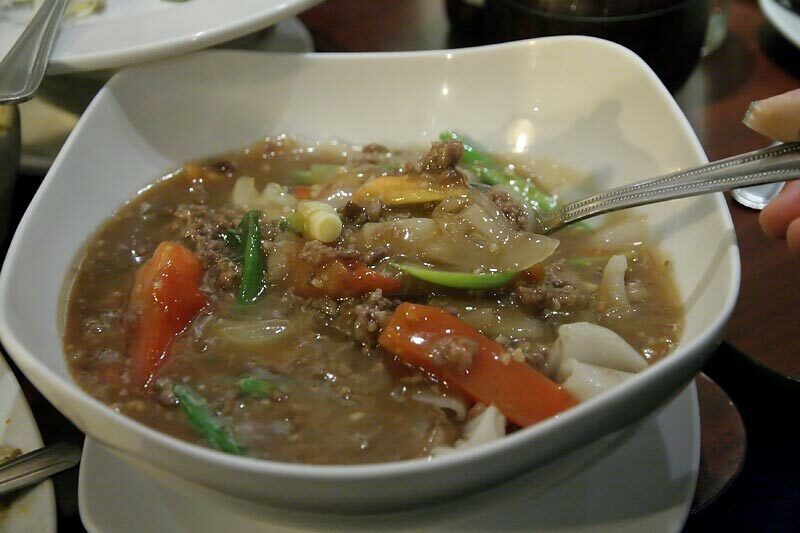 The rest of the meal was excellent too, although I was not a fan of the ground beef noodles - a little gloppy and a tad too sweet for me, although I liked the texture of the noodles themselves. The Khanom Jin Nam Ya also didn't really excite me. I just didn't find the flavors assertive enough. 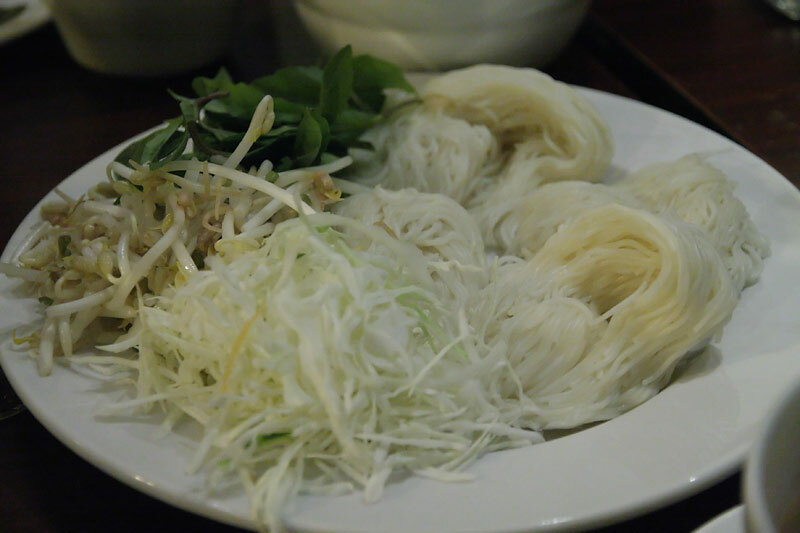 As for the funky bamboo shoots, I liked them but particularly when eaten in conjunction with the pork and crispy egg dish, which was both savory and sweet. To me, these two dishes worked harmoniously together. 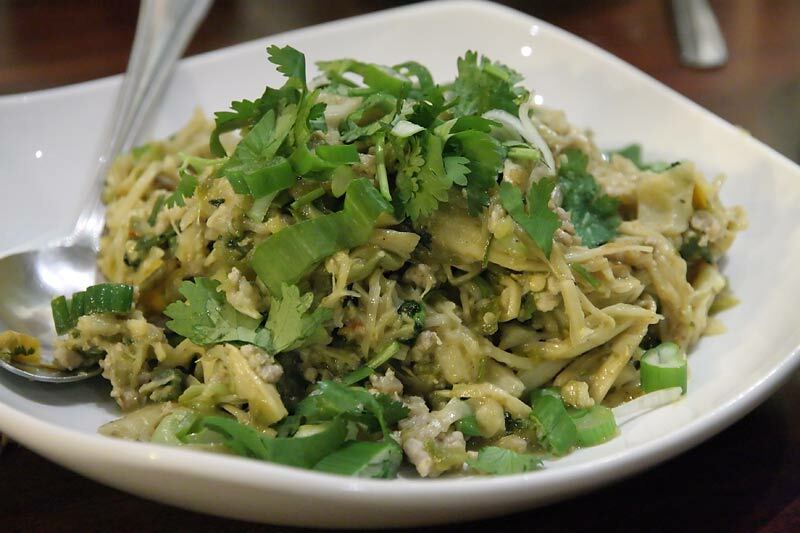 On its own and without a savory and slightly sweet counterpart, the bamboo shoots might dominate the taste buds. I have a bad habit of ignoring Aroy (Sticky Rice for that matter too), merely because it's a few blocks longer walk than Spoon and Rosded, but Thursday's meal guaranteed that it will be in my regular Thai food rotation. Thanks for the great photos, Ronnie. I've become a huge fan of Aroy. Since Rich and I first went a year and a half ago, it's become our go-to Thai restaurant, even though it's a bit further from home than Sticky Rice and Spoon. I think that Aroy is more consistent than my other favorite Thai spots (TAC included), and that there are so many wonderful, unique dishes. Plus, the family that owns Aroy couldn't be much nicer - - and instead of convincing us to stick to the Ameri-Thai menu, they've always been encouraging about ordering more adventurous dishes. 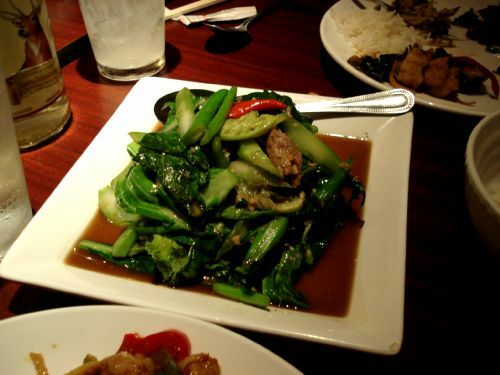 We've enjoyed sampling the Thai Classics menu, and our favorite dishes are among the photos Ronnie's shared. For anyone visiting Aroy for the first time without a crowd, I think the grilled pork salad and the beef tom yum are musts. Rich is a big fan of the chou-chi ground pork, which I was calling a Thai sloppy joe, but more accurately might be described as a Thai bolognese (IIRC, dansch should get credit for that apt label). It's rich, sweet, and spicy. The frizzly fried egg works well. My favorite dish is the funky pickled bamboo and green chile dish. It's not a delicate dish, and not one that I'd want a whole plate of for myself. But with the other dishes and a handful of sticky rice, it's a winner. 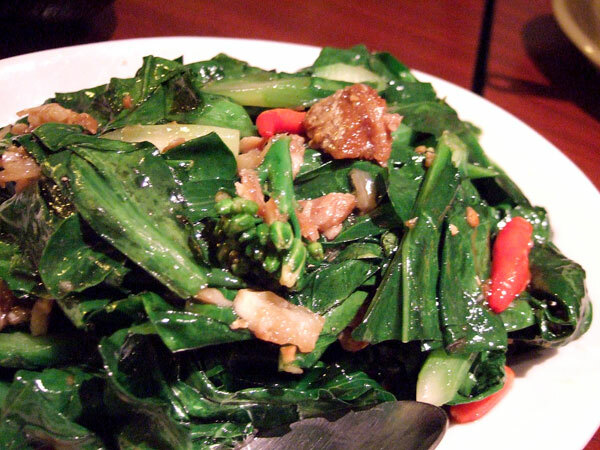 When I go to TAC, I want the crispy on choy. 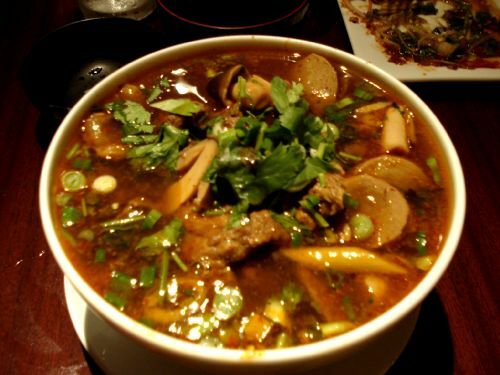 When I go to Spoon, I want the nam khao thawt. What's great about Aroy is that they serve several dishes that I crave. A few years ago I had a dismal Aroy meal with dismal dining companions. Its possible my disagreeable dining mates influenced my perception of the food, but in any case I have strenuously avoided Aroy since. In reading recent posts, and viewing Ronnie's pictures, it was evident an Aroy outing was in order. Lunch with agreeable dining companions was both pleasant and delicious, in particular Tom Yam Beef Ball and Tender Soup and Chou-Chi Ground Pork. Loved the crisp lace of fried egg topped with "Thai Bolognese"
We thought we'd order something not discussed in the thread, picked Fried rice with pressed ham hoping it would be like Deep-Fried rice with Northern Thai “pressed ham” at Spoon Thai. Not similar at all, but Aroy's light clean flavored fried rice interspersed with veg, egg and enhanced with funky sour fermented Thai ham was a standout on its own. Aroy Thai, count me a fan. G Wiv wrote: We thought we'd order something not discussed in the thread, picked Fried rice with pressed ham hoping it would be like Deep-Fried rice with Northern Thai “pressed ham” at Spoon Thai. Not similar at all, but Aroy's light clean flavored fried rice interspersed with veg, egg and enhanced with funky sour fermented Thai ham was a standout on its own. I've done the same thing, hoping that the dish would be similar to Spoon's nam khao thawt. While it's not as wonderful as Spoon's rice dish, and not one of my favorite dishes at Aroy, it's a fine dish and one I'd happily order again. Glad you gave Aroy another try and enjoyed it. First taken to Aroy by Erik M, it had been yrs since I'd been back (for no good reason, just off my radar). Won't make that mistake again. Been twice in the last wk. What I enjoy most are the amount of new dishes not in my Thai rotation. Thanks Ronna and Rich for showing me the way, again. I'm thankful for this thread, because Aroy has not yet created a takeout version of the Thai menu, so I've been using this and my poor memory to place delivery orders. 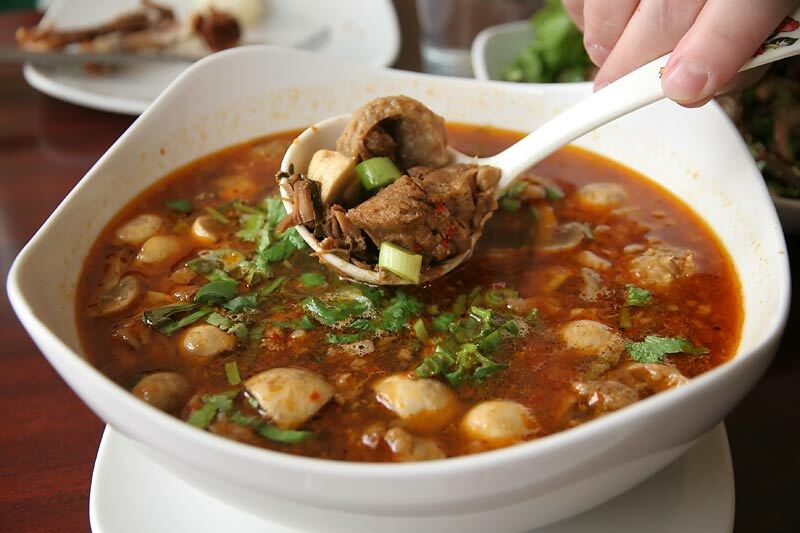 That beef ball tom yum soup just might be the single best soup in all of Chicagoland, and I think even Hammond would agree that the pork neck salad is phenomenal. I recently discovered the beauty in adding a bit of fresh dill at home to the Khanim Jin Nam Ya order, and it really livens up what is already a wonderful curry. On average, Aroy takes about 20 minutes longer than Sticky Rice to get to my door. I love Sticky Rice, so it's a testament to how much I also love Aroy that I often choose it anyway.